The traditional way of selling playing cards was through the stationery trade and to advertisers. 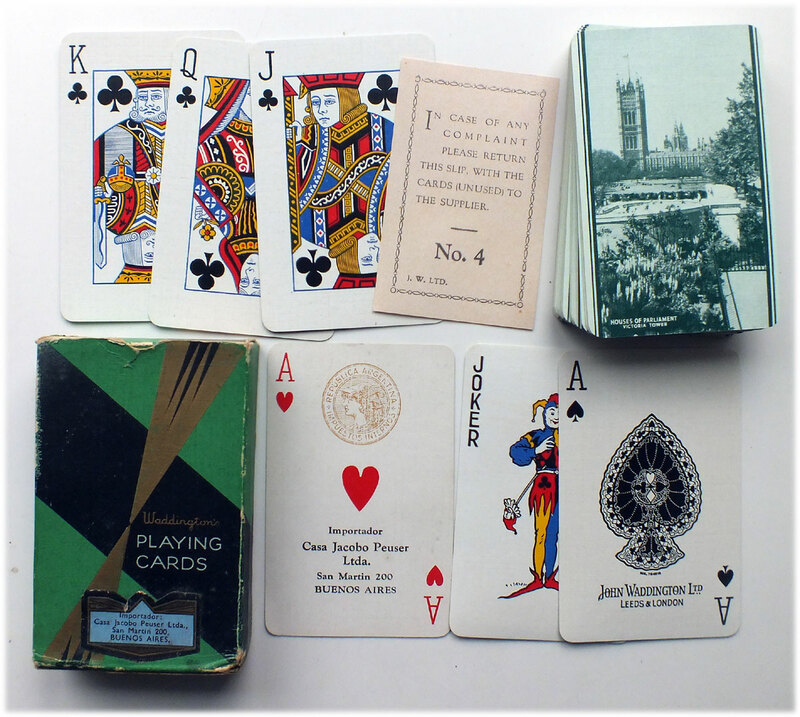 Mr Clarrie Hirst from Waddington’s sales and marketing department came up with the idea of selling playing cards carrying an advertisement to the stationery trade. 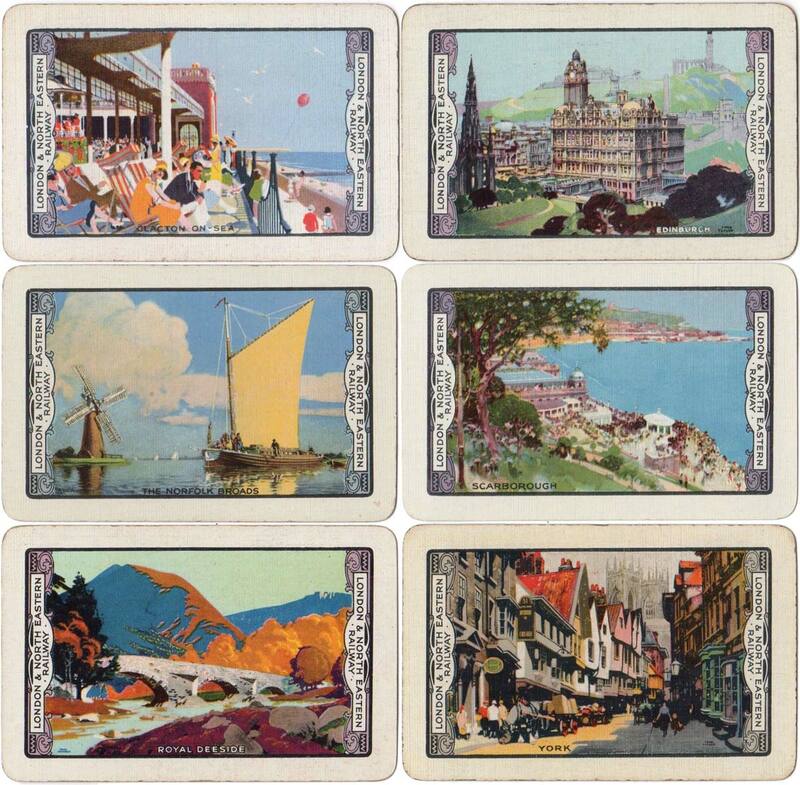 This became the basis of Waddington’s ‘Beautiful Britain’ playing cards which depicted scenes of seaside and country resorts. The first ‘Beautiful Britain’ series was introduced in August 1924, subsidised to begin with by the Great Western Railway. Packs carried the name or initials on the reverse with monochrome photographs in sepia or green of popular scenic locations on the the railway’s itinerary. This enabled beautifully printed playing cards to be sold through the stationery trade at a very competitive price due to this advertising. Above: scenic back designs for the Great Western Railway printed by John Waddington Ltd, 1924. 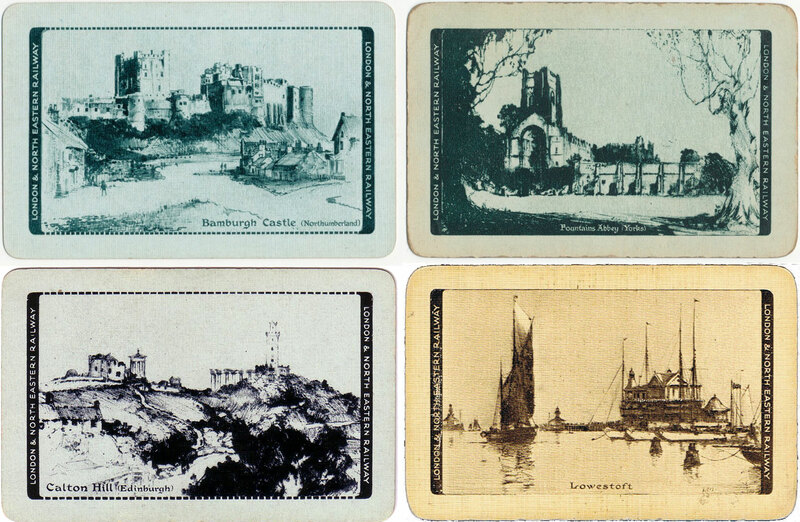 Above: a series of ‘Beautiful Britain’ backs sponsored by the Great Western Railway, published in 1924 showing a different scene at each end in either sepia or green. 1) Fishguard - Pembroke Castle, S. Wales. 2 & 3) Land’s End, Cornwall - Oddicombe Beach, Torquay. 4) Shakespeare’s Birthplace - Anne Hathaway's Cottage, Stratford-on-Avon. This project was very successful and contributed to Waddington’s rapid growth in the playing card field and to becoming competitors to the established De la Rue business. 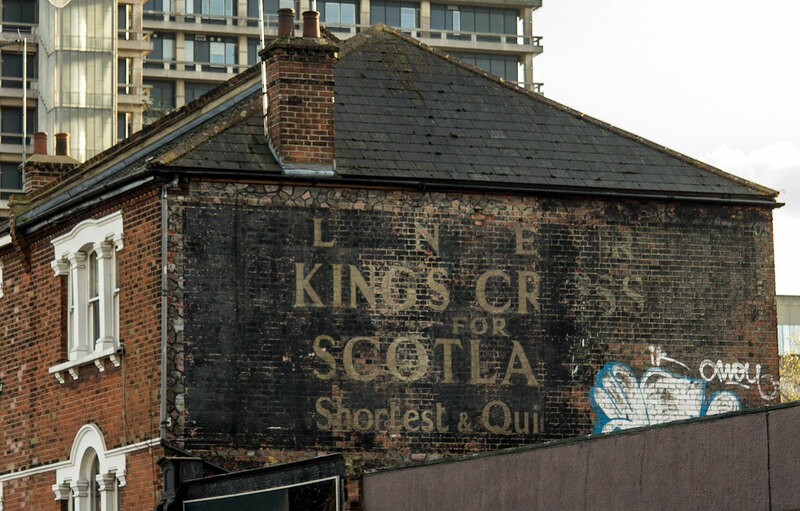 However, the Great Western Railway withdrew their sponsorship in 1925 but the series continued to be subsidised by the London and North Eastern Railway until 1929. New designs were produced by artists such as Austin Cooper & Tom Purvis for the new railway itinerary, printed in colour and with ornamental panels at each end, including Scarborough, Norwich, Cromer, the Yorkshire Coast, North Berwick, Edinburgh, Royal Deeside, Clacton-on-Sea, Fort William, Norfolk Broads, and York. Above: ‘Beautiful Britain’ backs sponsored by the London and North Eastern Railway printed in colour and with the wording in a scroll, 1925-26. A second type of design for the L.N.E.R. was also printed in colour but with the wording inside a black border at each end. 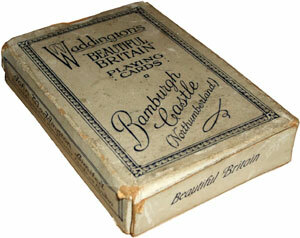 Designs known from this series include: Caister Castle, Forth Bridge, Scarborough, The Trossachs and Whitby. Above: ‘Beautiful Britain’ backs sponsored by the London and North Eastern Railway printed in colour and with the wording inside the border, 1926. The General Strike in 1926 had adversely affected Waddington’s well-being and in 1927 the more expensive process of colour printing was replaced with monochrome designs in sepia or blue-green on a lighter background. These monochrome designs were introduced in two different styles from etchings, mostly by Frank Henry Mason, with dotted borders or continuous borders. Scenes in this style include: Bamburgh Castle, Bridlington, Lowestoft, Newcastle-on-Tyne, Whitby, York [by Fred Naylor], Royal Deeside [by Sidney Lee R.A.], Houses of Parliament, Cruden Bay Aberdeenshire, Felixstowe, Harrogate, Scarborough [by Frank Newbould], Richmond Yorkshire, Hungerford Bridge London and Carlton Hill Edinburgh. Above: ‘Beautiful Britain’ backs based on etchings by Frank Henry Mason, sponsored by the London and North Eastern Railway and printed in monochrome, 1927-29. Above: two different versions of special ace of spades produced by John Waddington Ltd for the L.N.E.R. In 1930 the caption ‘London and North Eastern Railway’ was omitted on the back and the dotted border extended around the whole card. 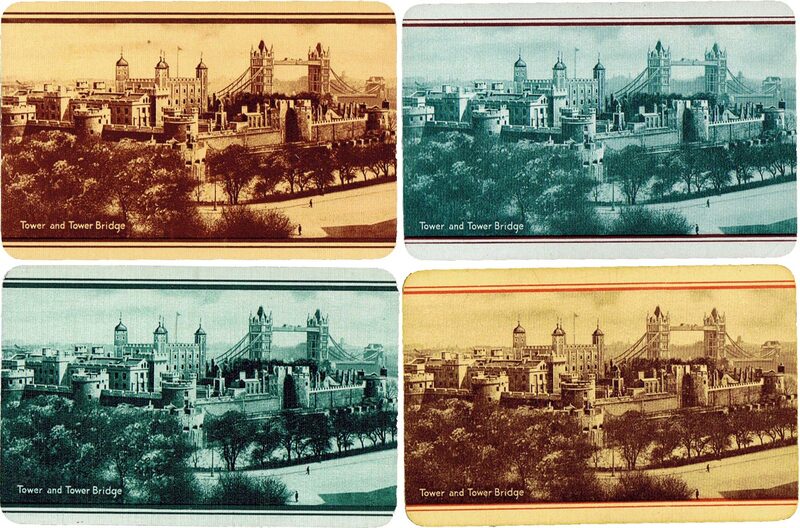 12 photographic scenes were issued in 1930 and again 1931 in this style, including: Westminster Bridge and Houses of Parliament, Tower and Tower Bridge, Loch Long West Highlands, Fountains Abbey, Melrose Abbey, Cambridge, the Forth Bridge, Ely Cathedral, Norwich, the Norfolk Broads, the Yorkshire Coast and York Minster. In 1933 only five of the 1930 scenes were issued and in 1935 eight of the 1930 scenes were issued. 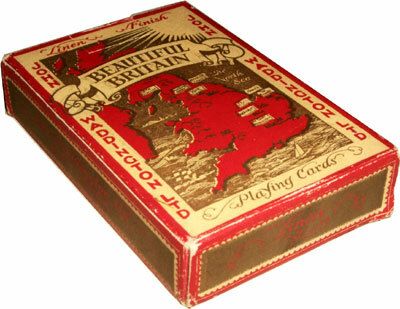 Above: ‘Beautiful Britain’ backs with continuous dotted borders, 1930-1935. 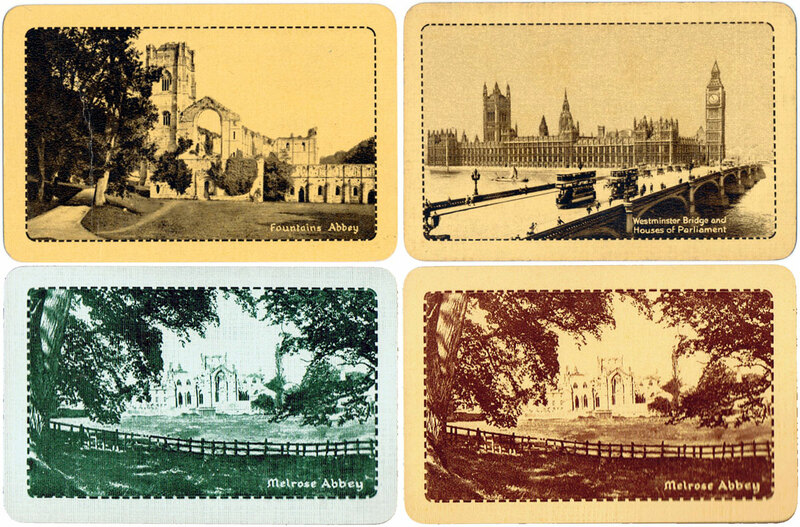 In 1938 the dotted borders were changed to a border on two sides only of 1 thick & 1 thin coloured lines and at least 16 different scenes were issued in this style, including: Norwich Cathedral, Tower and Tower Bridge, the Forth Bridge, Royal Deeside, Buckingham Palace, the Norfolk Broads, Big Ben London, Bootham Bar York, Oast House Kent, Conway Castle Wales, Bolton Abbey, Ben Nevis, Garnish Island, Glengarriff Co. Down, High Street Stratford-on-Avon, Lake District and Tower of London. Welsh, R.T: ‘Beautiful Britain’ a Waddington Series, Newsletter of the English Playing Card Society, No.5 November 1984, No.6 January 1985, No.7 March 1985, No.8 May 1985 and No.10 November 1985. Yardley, Edward: Frank Henry Mason. Marine Painter and Poster Artist, Colley Books, 2015. Page 33.